Washington: Despite skipping a crucial tri-nation talk, India has expressed hope that the long-delayed Iran-Pakistan-India gas pipeline will become a reality if buyers and the seller agree upon the price of fuel. 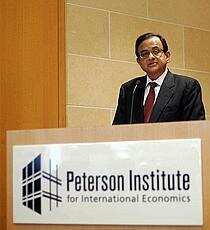 “I think if the price of the gas is agreed upon, the pipeline will become a reality," Finance Minister P Chidambaram said at an interactive session at the Peterson Institute for International Economics here. India is not attending a secretary-level meeting Iran is hosting in Tehran on 27 September, saying it will not take part in tri-nation talks unless transit fee issue is resolved with Islamabad. The meeting was to be preceded by discussions between technical experts and lawyers from the three nations on the gas supply contract. New Delhi and Islamabad have reached a broad understanding on the tariff payable to Pakistan for wheeling natural gas through the 1,035-km pipeline segment in that country, but the two nations haven’t yet arrived at an agreement on a separate transit fee payable to Pakistan for allowing usage of its territory for the pipeline. “There is no politics. We wish to have a pipeline...and all three countries, to the best of my knowledge, are agreed in principle on the need and feasibility of the pipeline. What is still not resolved is the price of the gas," he said. India and Pakistan, who had previously agreed on the price formula suggested by Iran, have differed with Tehran on its demand for price revision every five years. The $7 billion gas pipeline was proposed more than a decade ago to meet the energy needs of the two South Asian nations, but the project is yet to get off the ground due to numerous differences between Iran and the buyers. Chidambaram said Salman Shah, advisor to the Prime Minister of Pakistan, visited India three weeks ago and affirmed that Islamabad is committed to the pipeline. “In Iran, there has been some change of guard there. I don’t know the details." The Finance Minister was critical of countries opposing the project. “We are disappointed that some country should advise us against the pipeline for other geo-political reasons. We think that if Iran has gas, if India needs gas and Pakistan needs gas, there is nothing wrong in having an Iran-Pakistan-India gas pipeline." US is opposed to the project as it accuses Iran of harbouring nuclear weapon ambitions, a charge Tehran denies. Chidambaram emphasised that India as an energy-deficient country is entited to explore every option available to produce energy which essentially boiled down to three options — thermal, hydro-electric and nuclear. “However, we are concerned that we should de-couple carbon dioxide emissions from energy consumption. The answer to reducing emissions is not to not consume energy," Chidambaram said, pointing to the fact that India’s carbon dioxide emissions are one tonne per capita per annum in contrast with the world at four tonnes and the United States at 20 tonnes. “Therefore, we are not the world’s worst emitters". “We are completely open to every idea. We accept the principle that CO2 emissions must be reduced and de-coupled from energy consumption. But at the same time I submit we must consume more energy because energy is a sine qua non for development," Chidambaram maintained.